I was given an audit that I felt didn't belong on StackOverflow, but perhaps would be a better fit on CodeReview. I made this comment to the question as it was still a well worded question and not in need of down-voting or deletion, but the OP should consider moving it to a more relevant location. For making that comment I failed the audit because apparently asking people's opinion about how you wrote your code is an acceptable question on SO? The question: more efficient type-level computations using type families? Was this a bad audit or should I reconsider what is an appropriate question on SO? I'm not sure why the question was up-voted so many times honestly, it doesn't belong on SO and I stand by my comment. I probably should have even flagged it in the audit. Editing was the proper action there - the code is available, just not in the question. You'll find lots of non-audits in the First Post queue that make mistakes like this - that's why they're up for review. Commenting is pretty useless by itself; I won't say you shouldn't leave comments, but you should nearly always do something else as well. That said, we're rolling out a change that'll make it slightly more obvious when you try to comment on an audit. Aside from the whole audit, please look at the site's help center before migrating. The question fails #1. Do not migrate it to Code Review, we will close the question without much thought. 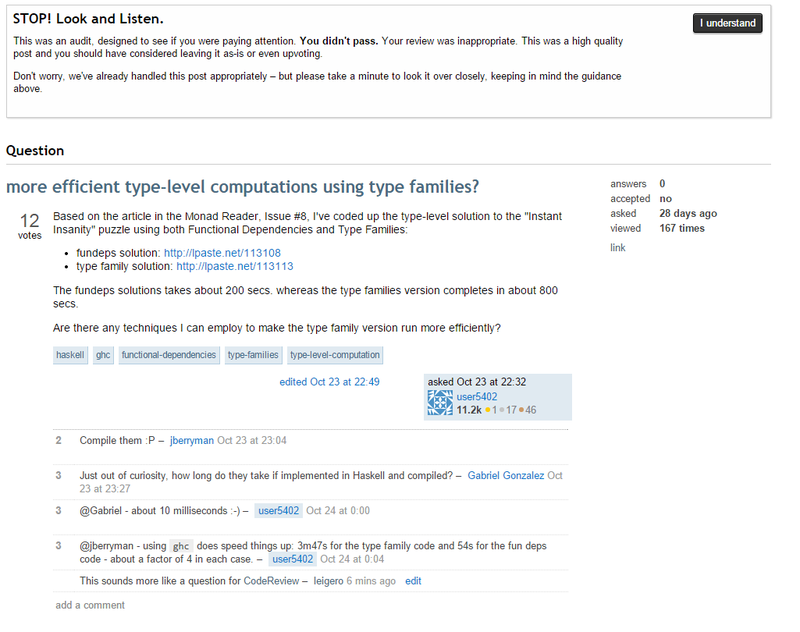 If you look at the Stack Overflow help pages, there is nothing there to say that if a question is on topic for Code Review then it's off topic here. a stop to all the attempts to kick questions out purely for being appropriate for Code Review. Not the answer you're looking for? Browse other questions tagged discussion comments disputed-review-audits . Is this is a high quality question? Adding a comment says it's an audit? Why isn't this question about a hypothetical scenario considered off-topic for Stack Overflow? Why is this audit question not 'Too broad'? How are audit posts selected? Should audits be more “cut and dried”? Is this answer really of very poor quality in Late Answers review audit?